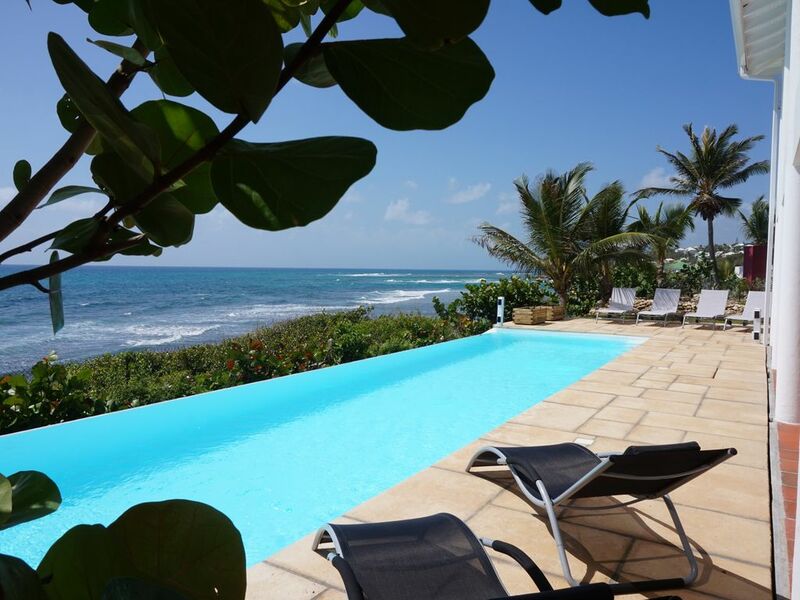 Superb spacious villa located on the coast with spectacular views of the ocean, the islands of Saintes, Marie Galante and Basse Terre. Panoramic pool of 12m x 4m (see video at the end of the photo album). The house is located on the tourist road in a quiet residence, 10 minutes walk, less than 3 minutes by car from one of the most beautiful beaches in Guadeloupe '' les raisins Clairs ''. Direct access to the sea less than 50 m, and less than 200m from a small natural cove. The city center of Saint François is 5 minutes by car, with casino, 18-hole international golf course, marina, shops, beauty treatments, bars, restaurants, market, ferry for excursions to nearby islands and a multitude of sports and nautical activities. The villa is composed of 4 air conditioned bedrooms including 3 overlooking a large terrace upstairs with stunning views of the ocean, 3 bathrooms upstairs and a bathroom on the ground floor, shower exterior. The kitchen provided with dishwasher, fridge, oven, microwave. The scullery with washing machine and dryer and fridge. A living room, a dining room, a small living room with a sofa bed. A large terrace on the ground floor with garden furniture and a large table to eat with views of the ocean and the pool. Panoramic swimming pool with overflow of 12 m X 4m with salt treatment, at the edge of the ocean is secured by a perimetric alarm. The spacious villa is tastefully furnished where you will find your comfort. Relaxation guaranteed for holidays in love or with family. Our family stayed at this beautiful property for 2 weeks during the end of March/beginning of April. We thoroughly enjoyed all of the amenities offered. The welcome Colombo meal was amazing, delicious, and a life saver for our late night arrival during the first night. All of the bedrooms were very comfortable. We loved the view of the ocean and pool from our room. The kitchen was well equipped and we used it for many meals. It was also nice that the property was close to Carrefour and Hyper Casino (for groceries). The pool was amazing. We loved spending the days lounging poolside, viewing the ocean, reading, and relaxing. We also loved our daily visits from the neighborhood iguana. Maryse was very helpful and attentive to our needs. Due to water conservation, the water is turned off on the island from 6pm-6am on some nights (at least during our stay). Maryse let us know ahead of time so we could plan accordingly. Overall, we LOVED our stay here and would recommend it to everyone. It was a wonderful home away from home. Superbe maison avec vue incroyable! Nous sommes partis 10jours au mois de mars avec notre garçon de 2 1/2ans, et nous avons adoré la maison. Très propre, cuisine complète, aire climatisée dans chaque chambre, piscine propre et vue superbe sur la mer! Très relaxant! Comme toutes les portes s’ouvrent, nous avions toujours la belle vue même en cuisinant. Pas vraiment de moustiques ce qui est plaisant lorsqu’on mange à l’exterieur Plages que nous avons préférée à proximité sont celles de St-Anne et la Caravelle, parfait avec un jeune enfant. Spot de surf très bien à 10min de voiture (Plage du Helleux). Mme Maryse qui nous a accueillie était très gentille et généreuse de son temps. Elle nous a bien conseillé au départ pour les endroits à ne pas manquer et comment s’y rendre. Catherine, la propriétaire, avec qui j’ai communiqué à propos de la maison répondait très vite à mes questions. Tout s’est fait très facilement. Nous recommandons la maison à 100%!! We had a great week in Guadeloupe enjoying this beautiful villa and nearby town. The villa is well equipped with comfortable beds, beautiful views, fully stocked kitchen. Catherine and Maryse we wonderful hosts offering lots of great advice and tips. We hiked the volcano, toured the zoo, explored the Eastern point, and found a great beach. Maryse suggested a bakery and restaurant and both were really good. We also ended the week with a one of Maryse’s home cooked meals which was very tasty. Thank you so much for your nice appreciation. I value comment to improve the stay of my client. We really enjoy having you as a guest. We are very lucky to have wonderful guests like you. Fantastic service and spectacular home! We’ve just returned from our vacation and it was so much MORE than we’d hoped. Your home was beautiful and immaculate and Alain, your caretaker, was always helpful. We definitely hope to book again! Thank you for your kind words, I'm glad you had a good time and that the villa was above your expectation. I will be delighted to welcome your group again. What a wonderful home. The view is fantastic. Large pool. Extremely well equipped kitchen. Many accommodations were provided for our young grandchildren. We would return in a minute. Multiple full bathrooms. Would work well for anyone. It is lovely! Thank you for your wonderful appreciation, I had a great pleasure to share the villa with your group, I would very much welcome you again, any time. We loved the 10 days we spent here. Having the pool right outside the kitchen and living area is an excellent feature we never knew we wanted so much until we had it. The views are stunning, including from 2 of the main bedrooms. And the location can't be beat.